NVN (for Outlook) 2.07 is pims & calendars software developed by Somebytes. Users of Microsoft® Outlook® will welcome this utility. It displays appointments and tasks on your desktop so you don't loose track. The desktop image remains fully visible. If you feel that your Outlook-Calendar is too many clicks away or you are loosing your appointments out of sight, then this fully customizable Desktop Calendar is the solution. 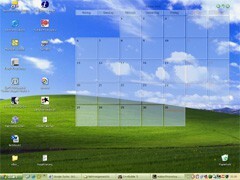 It runs in the system tray and can display your calendar in weekly, 5-day or monthly view. This business software is shareware, which means you can download and use NVN (for Outlook) 2.07 for free during the trial period (usually for 30 days). At the expiration of the period you will have to buy the pims & calendars product for $17.00. NVN (for Outlook) 2.07 is available at regnow and Somebytes website. NVN (for Outlook) 2.07 supports English, German interface languages and works with Windows 98/XP/Vista. We have tested NVN (for Outlook) 2.07 for spyware and adware modules. The software is absolutely safe to install. Our website has thoroughly tested business product NVN (for Outlook) 2.07, written the review and uploaded installation file (2305K) to our fast server. Downloading NVN (for Outlook) 2.07 will take minute if you use fast ADSL connection.